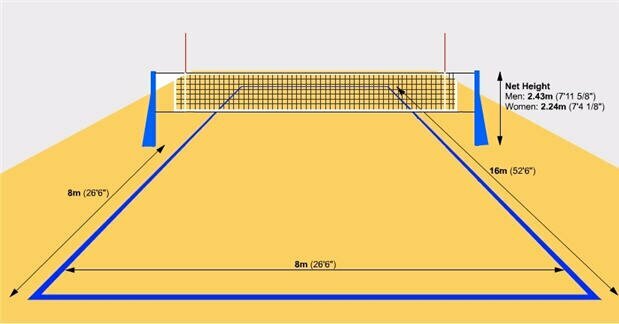 Beach Volleyball is played on a court, which is a little smaller than an indoor court and measure’s 16 x 8 meters which is divided into 2 equal halves by a net. Two sidelines and two end lines define the playing court. There is NO centre line. As in tennis, the boundary lines in beach volleyball are counted as part of the court, in other words on the line is in. The top of the net is set at the heights of 2.43 metres for men and 2.24 meters for women. Antennae attached to the net and set directly above the sideline mark the area which, the ball must pass between when hit over the net. The ball is made of leather with a bladder inside, and has a circumference of between 65cm and 67cm and weighs 260-280 grams. A team consists of 2 players and NO substitutions can be made. (However, in social competitions 2–6 players may participate). Players on each team aim to hit the ball over the net with their hands, although it is permissible for any part of the body to be used to hit the ball. Unlike indoor volleyball, the players do not have fixed positions and can play from any position on the court. Rally Point scoring is used. The winner of each rally, irrespective of which team served, scores a point. Serves can be made from anywhere behind the end line and may be struck under or over arm with any part of the hand, fist or arm. Service order must be maintained throughout the set. A serve cannot touch a player from the same team and players cannot obscure the opposition’s view of a serve. The server continues to serve until the serving team loses a point. A team may hit the ball 3 times to return it, but no player can hit the ball twice in a row including if it hits 1 part of their body and then rebounds to another part. A team scores a point if it hits the ball and it lands in the opposition’s half of the court. Rallies can be lost by hitting the ball out of play or into the net, or if a player touches the net with any part of his or her body while playing the ball. Shots may be blocked before they cross the net, as long as the blocker does not touch the net. The ball can be directed anywhere into the opponent’s court. The ball can be played off the net during a rally. Because weather affects play, teams swap ends every 7 points during the first two sets and every 5 points during the 3rd set. Each match is played over the best of 3 sets. To win a set, a team must have a 2-point break over the opposition. The match continues indefinitely until this is the case. The first 2 sets are played to twenty one (21) points while the 3rd, if required, is played to fifteen (15) points. Each team is allowed one thirty second time-out per set. There is a technical time out when the score adds to twenty one in the first two sets. No coaching is allowed during the match.